Mitt Romney, a candidate for the US President from the Republican, was a trending topic on Twitter yesterday. It was not a good thing since the trending topic was about a typo in his campaign app for iPhone. 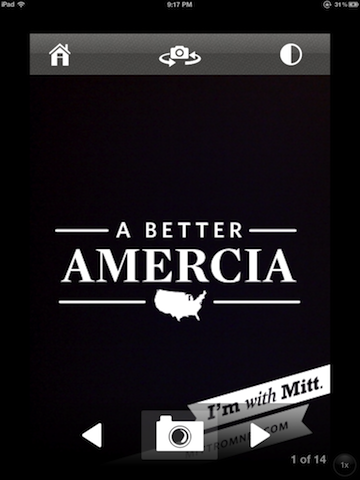 The apple application, intended to be Mitt Romney’s official campaign iPhone app, misspells the word “America” and it says “Amercia”. Instead of “A better America”, the slogan goes “A better Amercia”. One might consider the mistake as minor since such kind of typo can happen easily but it certainly is not small at the moment in America. Not at this time of the year when tension of rivalry is getting higher between Barack Obama and Mitt Romney. Both are running for the 2012 president of the United States of Amercia, oops America on the next election in November. As the saying goes, everybody makes mistake. However, a small mistake committed by an important person such as a candidate of the United States’ president can look very big. With such a small mistake, it becomes legitimate to question Romney’s commitment to the country. Due to the small mistake, people think it is right to ask Romney’s willingness to address problems America is now facing. Some say, for example, if he cannot even spell America correctly, how people can trust him to handle much larger problems. Other might also doubt and question whether they are going to risk their country’s future on somebody who cannot even spell the name of his country correctly. It might sound too much to relate somebody’s ability and commitment to run a country with a small mistake he made in spelling a word but this is a fact that Romney and his supporters must face. Like it or not, a small mistake such as a word typo can be excessively exploited when it comes to political rivalry. The moral of the story seems to be that everybody can make mistakes but the impact varies depending on who does the mistake and when the mistake is committed. Ordinary people can easily be forgiven for a typo such as “America vs. Amercia” but space of tolerance is certainly limited, if any, for such kind of mistake if you are running for president of the United States. Sometimes, it is not the extent of the mistake but who commits it that matters. I’m sure Romney didn’t spell it out himself. His campaign team did. Do you think he could stand against Uncle Obama? Honestly, I prefer Uncle Obama stays in the oval office. Romney? Thinks will be different for sure. Republican and Democrat are essentially different. One thing for sure, ’emotional connection’ between Indonesia and the US, at least from ordinary Indonesian perspective, will not be as strong as what they feel now.